Cell heating happens when a cell with low current is attached in a string which consists of some high short-circuit current cells. A single shaded cell holds the capability to reduce the current flow of the good cells by a huge margin, resulting in the production of higher voltages that in turn reverse bias the affected cell. In layman terms, the low current of the affected cell limits the overall current of the system. As a result of this, the extra current being produced by the good cells affects the good cells by forward-biasing them. A short circuit in the series then causes a reverse bias in the affected cell. Hot-spot heating occurs when a large number of series connected cells cause a large reverse bias across the shaded cell, leading to large dissipation of power in the poor cell. Essentially the entire generating capacity of all the good cells is dissipated in the poor cell. The enormous power dissipation occurring in a small area results in local overheating, or “hot-spots”, which in turn leads to destructive effects, such as cell or glass cracking, melting of solder or degradation of the solar cell. Hot spot heating occurs in a solar cell module when the operating current exceeds the reduced short-circuit current (Isc) of a shadowed or damaged cell or group of cells. When such a condition occurs, the affected cell or group of cells is subject to a reverse bias condition. Under reverse bias conditions, the cell starts to dissipate power. If this power dissipation occurs in a localized spot, damage to the cell can result. Damages can include: reflowing of solder, damage to the cell structure, or damage to the encapsulant and backplane. The typical condition that causes a hot spot is referred to as shadowing. Shadowing occurs when part or all of a particular cell (or group of cells) is placed into a shadowed (reduced light exposure) condition. This can be caused by a bird standing on a solar panel, passing clouds, or snow partially covering a portion of an array of solar cells. 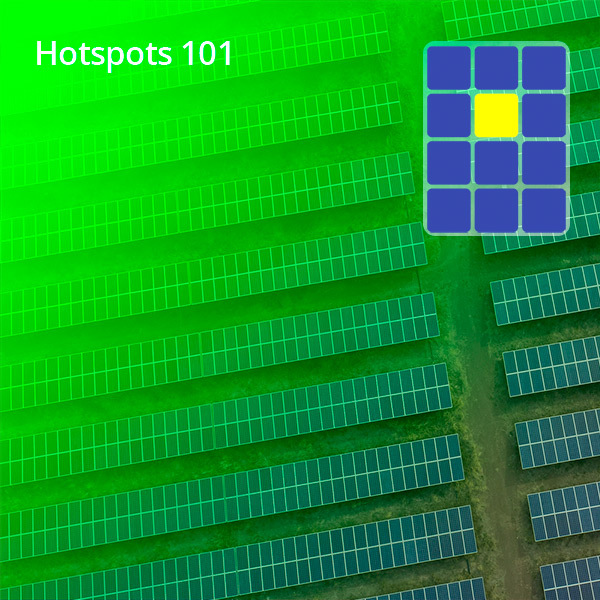 Hot spot heating occurs in a PV module when its operating current exceeds the reduced short-circuit current (Isc) of a shadowed or faulty cell or group of cells. When such a condition occurs, the affected cell or group of cells is forced into reverse bias and dissipates power, which can cause local overheating. When the weak cell Y is partially shaded it has lower Iph and thus will be under reverse bias. It will then be heated by the power generated by the other cells in the same string, as shown in Fig. 3. The by-pass diode will be in the positive working state when the sum of cell voltage in a string (Vstring) is less than the bypass diode activation voltage (-0.7 V).